Food Network Chef Ingrid Hoffman at the JCPenney lounge during the ‘Food Network in Concert at Ravinia’. Event attendants at the ‘Food Network in Concert at Ravinia’ hosted by JCPenney enjoying an afternoon full of good music and food. 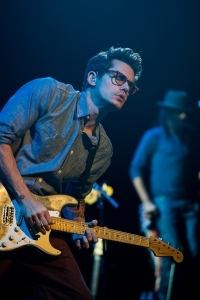 Singer and songwriter John Mayer at the ‘Food Network in Concert at Ravinia’ event hosted by JCPenney.